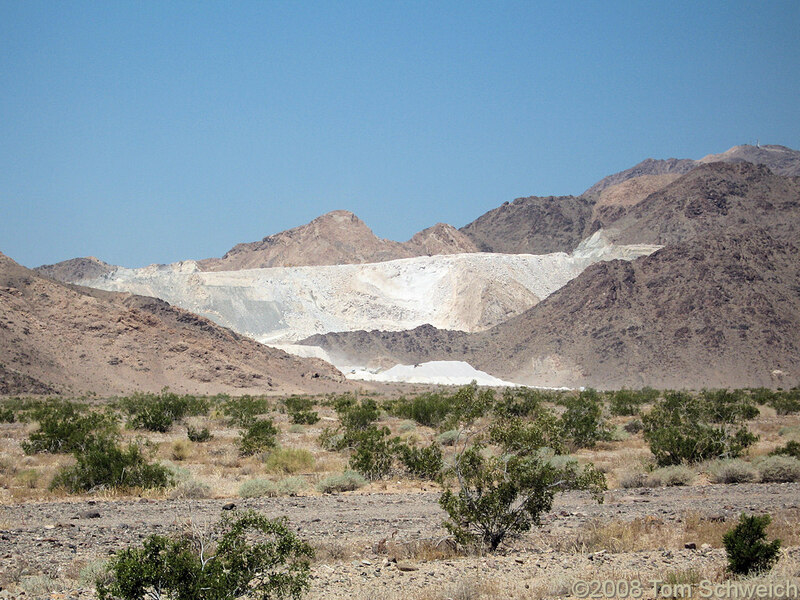 Omya (California) operates the Amboy Limestone quarry located 6 miles east of Amboy, California, in the southern Bristol Mountains. The Amboy Limestone deposit, a very high purity, high brightness (white) crystalline limestone deposit is of such high purity it is suitable for pharmaceutical and food grade limestone applications, and can be utilized in products for human consumption. The limstone is mined from an extensive dip slope of Mississippian age Monte Cristo Limestone, Bullion Member, up to 300 feet thick, and 1500 feet long. Current mine life is 55 years, plus reclamation phases for a total operation life of 70 years. The current Phase 1 quarry development occurs in an area of about 10 acres. The ultimate quary will cover approximately 50 acres. Kelbaker Road - Mojave National Preserve: near Amboy Limestone Quarry. Eastern Mojave Geology -- A Botanist's View: at Amboy Limestone Deposit. Other photos about Geography - Eastern Mojave or Unclassified.